First floor end unit, Beautiful! Pet friendly. Close to the Beach. 2 bed, 2 bath, sleeps 6, Lots of light. Luxuries like home. Fast internet. Everything is brand new, completely gutted, beautiful marble countertop and lots of upgrades. All the furniture is new along with all the kitchen dishes, glasses, bedding, mattresses, etc. The decor is beautiful and you will feel right at home with a large TV in the living room and master. Upgraded wi-fi and cable package. You have a storage shed and covered parking space. The storage shed holds beach chairs and beach umbrella. You will find everything you need in this home away from home. I live in Ohio and wanted a property in Florida that I could rent out. Cinnamon Cove has a lot of activities to keep you busy if you want to be busy. The many options of pools are great. There is a fitness area and they also have many group fitness classes. There is a tennis court and shuffle board court. The beach is just miles down the road as is the road to Sanibel Island. There is great shopping in the area. The restaurants and grocery stores are close and many options to choose from. My unit is a first floor end unit so there is a lot of light and it is very convenient to get to from the covered parking space. I also have a storage unit that has beach chairs and a beach umbrella and a cooler. Bath room in hallway for second bedroom or guests visiting. Tub/shower and vanity. Over the toilet storage area. Storage under the vanity and a medicine cabinet. You can sit on the lanai and see the water. Covered parking space for 1. There is additional parking in the lot. There is an elevator to the building but you don't need to take it to my unit. There is a table with 4 chairs to dine at. Large television in living room and master bedroom. Small TV in the 2nd bedroom. I have better than basic cable provided. There is grass around the condo if you need to take the dog out. There is a covered lanai. There on multiple pools on the property. Linda was a great host, the pools were fantastic, the Beauty Rest bed was awsome, beautifully decorated, great gated community. I rented this condo for 3 months and could not be more happy I chose this condo! First of all Linda is the nicest person and such a joy too rent from! I was lucky enough too get to meet her in person and she is the absolute sweetest and beyond accommodating! This condo is adorable and so comfortable not to mention the PERFECT location! There is absolutely everything you could need at Linda's condo, she has made sure of that and the entire grounds are beyond maintained with everyone being so friendly! I did not want to leave that is for sure! We did not like the view of a Parking Lot. We could have stayed at home for a lot less money. The Condo was rather dark, but otherwise everything was good. Everything you need was provided and everything was clean.We would not go back to Cinnamon Cove, we need to be on the Ocean. I couldn't of made a better choice for our accommodations while visiting Fort Myers. This fabulous condo conveniently located just minutes from Fort Myers Beach and Times Square was everything and more than I could have hoped for. This condo is professionally remodeled with fabulous upgrades it made our stay very enjoyable and was very comfortable. The first floor location, the covered carport parking and the interior laundry facility with all the modern conveniences of home makes this an easy choice for anyone looking for a home away from home. The view from the Lanai for morning coffees started our day out right. It was conveniently located close to shopping, entertainment, restaurants, the beach and Fisherman's Wharf. 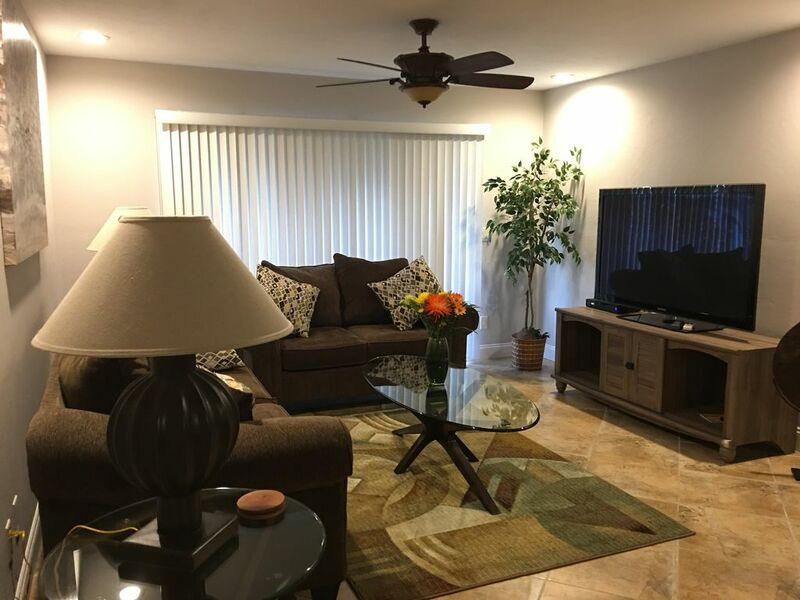 The community is well-maintained with beautiful palm trees and well manicured grounds. The 24 hour security is an added bonus. The community has more than two pools and they are very clean and well-maintained as well. If you're looking for a great location with fabulous accommodations this would be the place to go. I rate this condo a Five Star Plus for its great location and the newly renovated accommodations. Thank you so much for the lovely review. I'm thrilled that you enjoyed my home and the development. I couldn't have asked for better renters. Great stay in Fort Meyers! Linda''s condo was just perfect! It's completely updated with a beautiful new kitchen, two bedrooms and two bathrooms. All rooms are a good size, have a nice modern decor are comfortable and the 60" TV in the living room is the icing on the cake! Everything you need is in the condo. Linda is a phone call away and is very attentive to her tenants. Cinnamon Cove is a great community and close to the beach, shopping & restaurants. We thoroughly enjoyed our stay! Thank you so much for the wonderful review. I am beyond thrilled that you enjoyed your stay. I appreciate all the kind words. We had a wonderful time at Cinnamon Cove. The condo was in new like condition and very comfortable. We had a wonderful time at the condo. Everything was in new like condition and easy to take care of.